I have seen a large number of patients who developed various gastrointestinal symptoms after colonoscopy, such as cramps, abdominal bloating, alternating constipation and loose bowel movements. I now advise all my patients to take yogurt or kefir – goat milk products for individuals with dairy intolerance – as often as convenient for a period of 24 hours after the procedure. This simple measure markedly reduces the incidence and frequency of gut symptoms induced by colonoscopy. Such benefits appear to be related to the restoration of bowel flora following the disruption caused by bowel cleaning procedures required for proper visualization. Probiotics, of course, are important for far more important reasons. Twenty Colonoscopies – All Nonsense from Majid Ali on Vimeo. Five days a week, my lunch is yogurt or kefir rotating among various brands of cow milk and goat milk products. I prescribe yogurt and kefir (to be consumed in rotation) for nearly all my patients and take liberal amounts of a mixture of probiotics species (lactobacillus and bifidobacterium) for cold symptoms. I do so on the basis of what I have from my own gut and what my elders and my patients taught me. I do not say this because of silly notions of “scientific studies” conducted by companies that charge exorbitant amounts for their branded yogurts. Psyllium in Goat Yogurt for Loose Bowel Movements Majid Ali MD from Majid Ali on Vimeo. As roots are to lilacs, so the bowels to the liver. As roots are to hibiscus flowers, so the bowels to the heart. As roots are to tulips, so the bowels to the skin. As roots are to jasmines, so the bowels to the joints. As roots are to daylillies, so the bowels to the hair. As roots are to orchards, so the bowels to the kidneys. I could go on. The ancient summarized all this in simple words: death begins in the colon. I incorporate these relationships in my Sun-Soil Model of Health and Healing, and illustrate it schematically represented in the Figure. The readers can also see my article entitled As Roots Are to Roses, So the Bowels to the Brain on this website us for further discussion of this subject. In our toxic preoccupation with daily intramural murders, we are missing the central story of our time: an epic planetary struggle between the oxygen-loving and oxygen-shunning species, and the incremental victories of the latter. A monumental tragedy of mass extinction of species is playing out on the global stage. Oxygen-loving frogs and related amphibian species are being decimated by oxygen-shunning fungi. The oxygen-shunners are also responsible for disappearing butterflies, the collapsing bee colonies, and the death of bats with fungus-ridden noses that fly out of their caves in broad daylight and drop dead. Humans are also fully engaged in this struggle, and losing with spreading epidemics of mystery maladies—chronic fatigue syndrome, fibromyalgia, brain fog, polycystic ovary syndrome, low testosterone levels, gender devolution, memory deficits, and rising incidences of autism and nearly all forms of cancer. Regrettably, the main body of physicians is oblivious to the underlying ecologic shifts and their effects on the man-microbe conflicts. In servitude of The New England Journal of Medicine, they continue to seek answers only in increasingly potent—and toxic—drugs. Such drugs, of course, are valuable in the short run and wreak havoc on people in the long run. Some years later, a friend told me that some quack-buster had derided me for introducing the term bowel ecology. Imagine my gratification when Nature—the most prestigious science journal in the world, in my view—in December 2006, 26 years after the publication of the Altered States of Bowel Ecology, put the words gut ecology on its cover. I refer the readers interested in an in-depth discussion of the subject to my book Oxygen and Aging (2000). Below I also include text from a reader concerning the value of probiotics for controlling eczema. “I just have to say that probiotics have been a miracle in our life! Our little boy has suffered from severe eczema and allergies since he was born. No one could help him! It was so frustrating, as we tried creams, meds, allergists, doctors of all types, etc. Nothing. We were even told that he was “a gray area” and that we should just learn to cope. I did not want to accept this and read and read so much. Finally someone told us about xyz probiotics (the name of a commercial product withheld) and we knew we wanted to give it a try. Afterall, it was a lot healthier for him than some of the other treatments that were suggested! Our prayers were answered with these as he quickly began clearing up! He now looks and feels like a happy and healthy little boy and we all take our xyz probiotics. Our kids take the kids chewables and they think they are so so yummy! We love them because they work!!! What Can parents Do Part 11 Eczema Majid Ali MD from Majid Ali on Vimeo. I close this article with brief comments about what Darwin teaches us regarding the bowel ecology and microbiota. Biofilms are microbial tribes abiding the Darwinian imperatives—adapting to dynamic changes in the oxygen conditions and availability of food to sustain the growth requirements in their microecologic conditions. Dysoxygenosis (dysox) is the state in which oxygen homeostasis is disrupted—locally or systemically—to favor fermenting microbes in their competitive struggle for food against other microbial species. To cite one example, mercury in dental amalgams is one of the most, if not the most, potent disruptor of oxygen metabolism in the oral cavity. Microbial toxins are other factors that alter the local conditions which either inhibit or foster microbial growth, so facilitating biofilm formation in the mouth. Similar oxygen-microbial dynamics play crucial roles in the formation of biofilms in the stomach and the bowel and in the pathogenesis of various systemic disorders. Probiotics from yogurt, kefir, and other sources are crucial for fighting biofilms in the various regions of the alimentary tract. Can Probiotics Be Harmful – Majid Ali MD from Majid Ali on Vimeo. 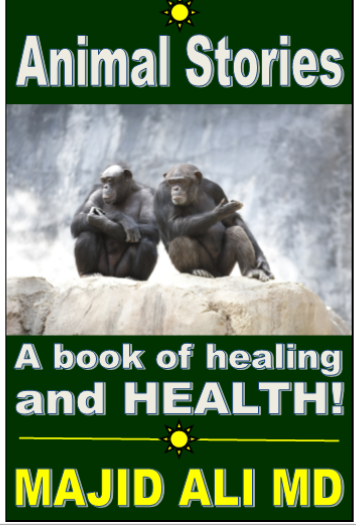 My Animals Speak for Healing, Calling a Spade a Spade – www.kids123.org from Majid Ali on Vimeo. A Dog Tells the Full Story of High Blood Pressure – Childrens Health Corps – www.kids123.org from Majid Ali on Vimeo. Dr. Ali’s first new book in years! -Book PDF only – yours for a $25 donation! Your tax deductable donation helps keep this site growing! Please donate $25 for the book!